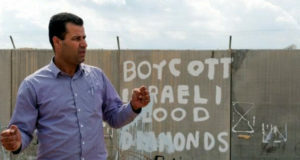 Every Friday for well over 150 weeks, the people of Bil’in have been holding a demonstration against the theft of their land – caused by the Apartheid Wall. Each demonstration has a different theme and it’s quite a challenge to think up a new one every week. ‘Fortunately’ the Israeli Army provided this week’s theme – the shooting at Nil’in of the bound and blindfolded Ashraf Abu Rahman, aged 27, while he was being detained after a demonstration there on the 7th of July. 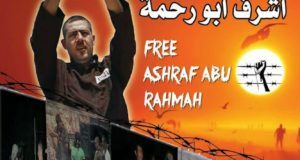 Ashraf lives in Bil’in and is a brave man, as he agreed to march at the front of today’s column, wearing the same clothes he was shot in, and similarly bound and blindfolded. An estimated 100+ Palestinians, International human rights workers and Israelis, including the Israeli Anarchists Against the Wall group marched out to the wall, opened an outer gate, and marched along parallel to the fence until stopped by an inner gate. 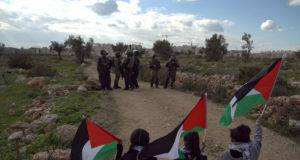 Israeli troops shadowed the march along the fence, and opened fire with volleys of tear gas whentowards the end of the protest one or two Palestinian boys threw stones at the soldiers. The tear gas, spread by the wind which was blowing directly in marcher’s faces, caused everyone to retreat back to the village. One Palestinian man suffered a sprained wrist as he fell while trying to evade the teargas. Virtually every marcher suffered the effects of tear gas, some people had to helped along by those less affected. Next week’s protest will take place on Friday at 1pm, as it has on every Friday for the past 3 ½ years.